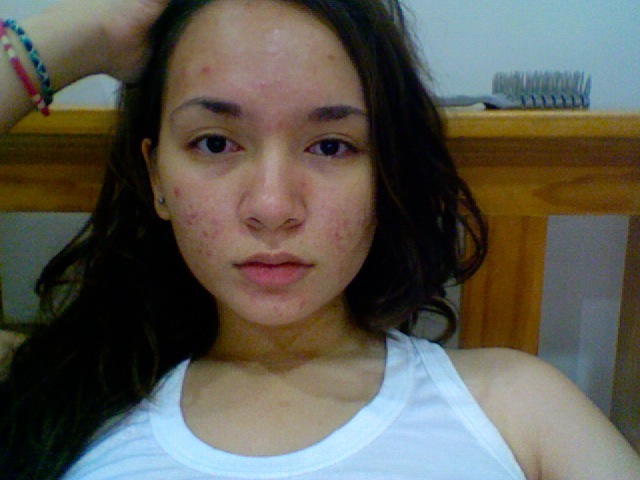 acne is my biggest insecurity. my peers always tease me about it, and it just makes me feel so bad and outcast..
Photo Information for acne is my biggest insecurity. Hope you don't mind me saying this, but awww! You have the cute acne! That's acne on the cheeks. I think it's cute, haha. I get acne all over my jawline and the sides of my face. Not cute acne. I have cured my acne in a couple months. I have struggeled with severe acne for about ten years. Accutane was my last resort. Before my seven month period on Accutane, I had been on 6 different antibiotics and dozens of different topical medications. (Tazorac, Retin-A, Differin, Axelex.. etc) Every time I would leave the dermatologist I was so excited (in hope for clear skin) but after so many different prescriptions my acne was still there. I was devistated. I couldn’t keep putting those chemicals into my body when nothing even worked. I had about 70 pimples on my face at a time with at least two new appearing daily. I had cystic acne that kept getting worse. The bizarre thing was, I had already been on Accutane. My skin was perfect for about a year, but after that year I had broken out worse than ever. I couldn't take it anymore. When I thought of myself, acne just wasn't a part of who I was. After my dermatologist persistently told me food has nothing to do with it, it just didn’t make sense. I went to a herbalist and iridologist to try to clear my skin, but my acne was still there. I believed there was nothing I could do about it except grow out of it. But when you have bad acne, that’s a miserable option. After researching every day for months I have finally found a cure to my once severe acne. I am SO happy!!! I want to help people who are in the same position as I was a couple months ago. Currently I have not one pimple on my face. I believe this works just as well as Accutane without the terrible side effects! I have tried pretty much everything, but this regimen healed my face: GIVE IT A TRY! Vitamins cleared my skin. Better than anything else. I started drinking a bunch of carrot juice because it is high in Beta- Carotene. I saw it immediately helping my skin. It is safe to take larger doses of Beta Carotene because whatever your body doesn’t need is stored in your body and released over time.. and you may hear that you turn slightly orange, but this never happened. 2. In order to properly absorb the beta-carotene, take OMEGA 3 & 6. (you can buy this at whole foods) Take one of these a day the same time you take the beta-carotene. 3. I also wash my face day and night with NEEM soap. (I bought this at whole foods, or you can buy it online.) This soap is extremely gentle. - What everyone tells you is true; NEVER PICK YOUR SKIN. As hard as this is... don't do it! Trust what everyone says. Your face will clear up. 4. After washing apply a pea-sized amount of NEUTROGINA benzyl peroxide 10% to your entire face. (You can get this at CVS, Walgreens, ets.) -This isn't all natural, but with the combination of vitamins; it works. I hope this helps!! It worked wonders for my skin. If you try my regimen, let me know how this worked for you!! we are all in the same boat. dont over think it. when i first saw this picture the first think i thought was your beautiful. people dont notice your acne as much as you do. confidence is key. if you act like its not there people will see you for YOU and not your acne.